Zouk is a sensual partner dance with roots in Lambada and Samba de Gaffieira. Over the years Zouk has internationally developed as one of the most versatile partner dances, with flow and connection as the most important aspects. Of course the Brazilian influence can still be recognized, the characteristic hip movements and intense experience make Zouk the number 1 partner dance for a lot of people. In the beginners class you will learn the fundamentals of partner dancing by practising figures and patterns. Beside the patterns you will focus on the underlying techniques for partner dancing and for the individual body so you can enjoy this dance for a long time without injuries. 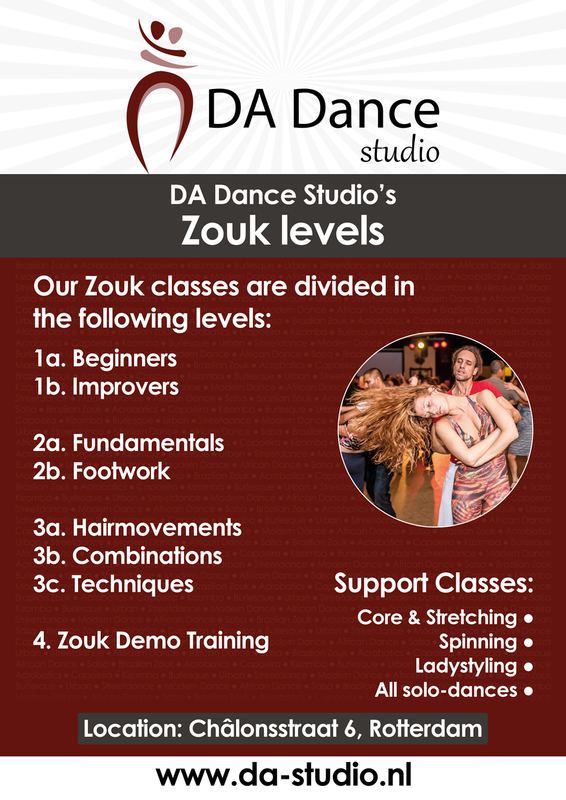 Another important aspect of Zouk is the music, in class you’ll learn how to listen to the music and translate the music in movements. In this course the first steps will be taught. Also a big emphasis will be on the feeling of Zouk in your own body and how to communicate with your partner. Most of the basic steps and turns will be taught. This course contains a lot of material, so after this course people can start going to socials to practise what they have learnt. In this course the emphasis is on how you use your lower body. All basic steps and turns are dissected and trained with exercises to make sure the feet slide over the floor, the body weight is shifted to the beat in Brazilian fashion and the hips wring in a Zouk way. Of course time will be spent on how to lead and follow these aspects in this dance. Apart from the material in the beginners course and the focus on the lower body in the footwork course a lot of attention will go to the midsection and upperbody. The balão, cambre, elastico and chicote will be thoroughly trained and the roasted chicken, tilted turn and body isolations will be touched upon. This course is all about leading and following hairmovements. These are movements specific to Zouk. Hairmovements are upperbody isolations in which the lower body and midsection are supporting but not moving with the ribcage culminating in the typical hairmovements. All the elements balão, cambre, chicote, elastico, roasted chicken and tilted turn will be trained intensively. The lateral hairmovement, the traveling tilted turn, the boneca and the balão matrixes will be touched upon. In this course we assume basic knowledge and skill of footwork and hairmovements, so all 24 elements will be arranged in different combinations. Every other week a new combination is taught in which 1 or 2 themes are central; e.g. tension modulation, upper body isolations and transitions. This course can be compared to advanced courses at other schools. In this course we try to get people to a (semi) professional level, making sure all concepts are clear. Apart from being able to apply all 24 elements we strive to improve the connection between the partners, focus on dynamics within the movements and work on creativity and musicality. This course is typically for people who experience a ceiling in their dancing after dancing for a few years. This course is for people who aspire to be an ambassador of Brazilian Zouk. We try to bring out your passion and personality in a freestyle demonstration. The learning goals here is what to choose music and clothing wise and how to tell your story; e.g. what is it about, what are the partners to each other, how does it begin and end. Using a basic format dancers are being made aware of what should go where in time and space. At the end of the class each couple dances 1 or 2 demos of 2 minutes.